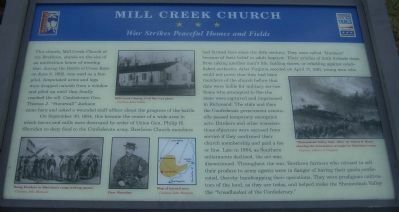 Over at the Loudoun County Civil War Roundtable site, blogosphere pal Craig Swain makes mention of the events of May 21, in Waterford, Virginia. The folks up that way are giving a good deal of attention to the Loudoun Rangers, and it’s great to see. Meanwhile, I hear that another blogosphere friend, Ron Baumgarten has a post coming up about his experience yesterday at Lydecker’s Store in Vienna, where he witnessed a reenactment of the referendum on secession. So, yes Virginia, Unionism was alive 150 years ago, and it’s being recognized in Virginia Sesquicentennial events! Very good to see. Remember… Marylanders were Southerners too! But, before you break out in song with “Maryland, My Maryland,” just remember, the song does not reflect the feelings of all Marylanders in 1861. Many a Marylander can be classified as a Southern Unionist. With that in mind, I am going to redirect reader attention to a series of posts (begining with this one) on my main blog for a little while, where I am focusing on the unique story of Southern Unionism that existed in Maryland. I’m focusing, in particular, on a district in Washington County, Maryland. When reviewing a Confederate unit history recently, I ran across a remark made by the contemporary author (not a person who actually lived during the Civil War) about the men of Samuel Means‘ Loudoun Rangers (see this link for an interesting history of the unit… strange to say, the author of this article also uses the word “turncoat” in reference to the Loudoun Rangers). The Loudoun Rangers were, for the most part, Virginans (at least Co. A… Co. B consisted of more Marylanders) from Loudoun County (and the surrounding area) who not only refused to buy into the idea of secession, but were members of a unit in the service of the Union army. Means’ unit was an example of what I consider Southern Unionism taken to the “nth” degree. Since the men of the Loudoun Rangers did not wear Confederate uniforms before they donned the blue uniforms, the word “turncoat” doesn’t fit. Maybe some Virginians who bought – lock, stock, and barrel – into the idea of secession and Confederacy, considered these Unionist Virginians as“turncoats,” because the Confederate-leaning Virginians saw things as state first, country second. On the other hand, the Unionist Virginians of Means’ command probably saw the secessionist Virginians as turncoats, having turned against the United States… the Unionist seeing things as country first, state second. So, did the author go a little too far? Is this an indication of the author’s personal “sympathies” for the Confederates as well as an indication of a little animosity toward the Loudoun Rangers? Is this an indication that the work is about a “bushel” short of objectivity? Does the author inappropriately weave this sympathy into the history to invoke a sympathetic feeling in the readers for the Confederates and animosity for the Loudoun Rangers? Unless I can ask the author specifically what his/her intent was in saying this, and because there is an absence of any quotes from the Confederates identifying the Rangers as “turncoats,” my first inclination is to suspect the author of failing in the delivery of objective history. At least it doesn’t appear to be history delivered in a manner for the reader to read, consider, evaluate, and form opinions on his/her own. Some say that objectivity truly isn’t possible, but would you prefer lack of objectivity being transparent or opaque? This post is dual posted in Cenantua’s Blog. For thirty years, Newt Knight, Captain of Mississippi’s most notorious band of deserters, the Knight Company of Jones County, pursued compensation from the federal government for himself and his company. Newt initiated his first claim in 1870, before the Southern Claims Commission had been established (RG 233, Box 15, HR 1810). He did not base his claim on civilian loss of property, but rather on military services rendered to the Union Army. He asked that he and each of his “officers” and “privates” be granted the pay due them as soldiers by the U.S. government which they had fought for during the Civil War. The only problem was that no matter how many battles the “Knight Company” had fought against Confederate forces during the Civil War—and there were plenty—it was never granted official military status by the Union Army. In 1870, 1890, and 1895, defenders of the Knight Company submitted affidavits and depositions attesting to the activities of the company on behalf of the Union Army. In the end, however, Newt failed to convince the U.S. Government to issue his men what in essence amounted to military back pay. The following are excerpts from depositions provided in 1890 and 1895 by Harmon Levi Sumrall, one of Newt Knight’s strongest supporters. Harmon was beyond the age of conscription in 1862, but his younger brother, William Wesley, joined the Knight Company in 1863 rather than serve the Confederate Army. Harmon supported his brother’s decision, and, prior to providing depositions for Newt’s second and third claims (#8013 and #8464), had signed an affidavit for the first claim that attested to the sincerity of Newt’s Unionist beliefs. In 1895, for reasons not entirely clear, a new round of depositions were gathered and a new claim number assigned to Newt’s case (the claims would later be merged). Once again, Harmon Levi Sumrall was called on to testify on behalf of the Knight Company. On January 29, 1895, at the Ellisville Court House in Jones County, Sumrall again recalled events that were now thirty years in the past. Sumrall replied “yes” to the government’s question of whether Major Hensley was “hunting up men who had deserted from the Confederate Army.” Most interesting of all, however, were his remarks about HIS own role in the skirmish that followed. He stated that “Hensley pressed me in to go with him to Knight. We hunted him all day; we found him in the evening when the fight occurred.” By his own testimony, then, Harmon Levi Sumrall was forced to join a search for a band of deserters that included his own brother! Major Hensley would not likely have known this; he was simply impressing the local population of men to assist him in a dangerous task. Sumrall’s maddeningly brief remarks raise several questions about the complicated nature of home front battles between deserters and Confederate soldiers sent from outside the region. Did Confederate militia purposely enlist local men to search out deserters in hopes that those deserters would be less likely to fire on their own neighbors and possible kinfolk, or were they simply taking advantage of local manpower to lessen the dangers of their mission? And how did Sumrall respond to the task assigned to him? Did he just fake it, and hope that in the process he could somehow protect his friends and relatives from discovery? Does Sumrall’s testimony that it took them “all day” to find Knight suggest that he withheld knowledge of the band’s whereabouts? What, then, were his actions at the point of contact between Confederate forces and the Knight Company? And in the ensuing battle? I would love to hear from readers who may have encountered such scenarios in their own research on the Civil War home front. AUTHOR’S NOTE: I provide a detailed account of Newt Knight’s long struggle with the U.S. Court of Claims in “Fighting a Losing Battle: Newt Knight versus the U.S. Court of Claims, 1870-1900,” chapter four of my book-in-progress, Southern Communities at War: Essays on Civil War Era Dissent and it’s Legacies. In keeping with my recent Renegade South posts about the Unionist Collins family of Mississippi and Texas, I am posting here information from the pension file (#120091) of Riley J. Collins. Riley was the ninth of Stacy and Sarah Collins’s 14 children. Born around 1825, he was their fourth son. Riley, who publically opposed secession, was a founding member of the famous Knight Band of the “Free State of Jones” County, Mississippi. In the immediate aftermath of Confederate Col. Robert Lowry’s attack on the guerrilla band, he and several other members fled to New Orleans where they joined Co. E of the 1st New Orleans Regiment. Mustered into service on May 4, 1864, Riley died on August 31, 1864, less than three months later. Like so many soldiers, he died of disease rather than battle wounds. Riley’s pension file is relatively short and uncomplicated since he had evaded rather than deserted Confederate service before joining the Union Army. What his file papers reveal most clearly are the personal tragedies that accompanied the Civil War for the Welch and Collins families of Jones County. Several affidavits attest to the death of Riley’s wife, Desdemonia Welch, on September 25, 1862. Her fatal illness, which left him with four motherless children, ages 3 to 10, would surely have reinforced Riley’s decision to evade conscription. If not for Lowry’s raid on his neighborhood, he no doubt would have remained an outlier for the duration of the war. Instead, he died serving the Union Army, leaving his children orphans in the process. Older brother Vinson A. Collins was appointed their guardian, and applied for and received Riley’s pension. Pension records are replete with stories of soldiers who, like Riley Collins, died in appalling numbers from disease. Reading Riley’s papers, one is struck by the senseless death of a 37-year-old widower with four children who felt his only choice was to fight for the Union against men of his own divided community rather than fight for the “Lost Cause” of secession that he so adamantly opposed. As I noted in my last post, Riley’s brother, Simeon, equally Unionist in principle, made a different choice. Facing execution for desertion, he surrendered to Col Lowry, rejoined the Confederate Army, and ended up in a Yankee POW camp. The end result was the same. As that post noted, Simeon died from illness shortly after his release from prison in 1865. 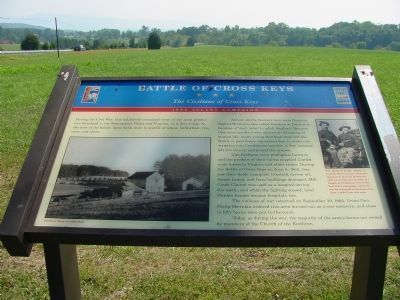 While it was clearly against the accepted practice among the Brethren (German Baptist Brethren), Jacob P. Kyger of Rockingham County, Virginia joined the 35th Iowa Infantry in 1862, fought at Vicksburg and the Red River Campaign… and returned to his farm in the Shenandoah Valley (on the Cross Keys battlefield) after the war. Take a look at the following marker for a photo of Kyger (in the upper right on the marker).